We also provide an implementation to convert a binary search tree from an implicit inorder layout to implicit van Emde Boas layout. 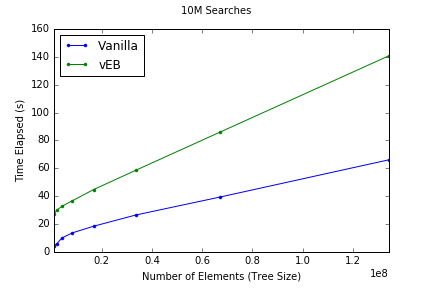 Search trees were constructed using random data with sizes between ~ 1M - 100M. Both inorder and van Emde Boas variants were constructed. The conversion time / cache misses from inorder to vEB is included in the observations. Although this impact is non-trivial, the hope is that by performing many searches the upfront cost of conversion will be amortized. 10M searches for random numbers were performed. Initial results look promising. vEB searches show about 50% reduction in cache misses, although improvement seems to wane for larger search tree sizes. The big concern is the significant longer execution time. Even with fewer cache misses, the vEB searches take longer to perform. And the execution time is increasing at a faster rate than the inorder scheme. This could be due to the non-trivial overhead of traversing a vEB tree. 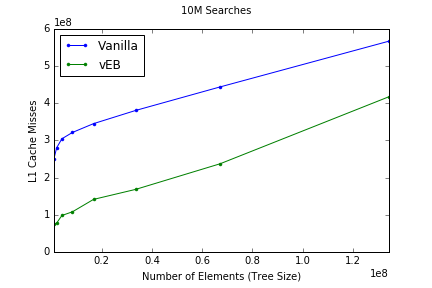 Future research might include observing the results of using the van Emde Boas binary search scheme on external search trees, i.e. when the tree size is too large to fit in RAM. The goal of Cache Oblivious algorithms is to efficiently use data in a CPU cache and reduce unnecessary swapping of data between slow to fast memory. The big win of a cache oblivious algo is that this efficiency works at any level of a memory hierarchy, e.g. from RAM to CPU cache or from Hard Disk to RAM. Rønn, Frederik. Cache-oblivious searching and sorting. Diss. Master’s thesis, University of Copenhagen, 2003.